The 2017 proposed double digit price increases for medical aid schemes will further squeeze consumers already reeling under pressure from rising unemployment, low salary increases and escalating personal debt. Current membership across all South African medical schemes sits at 8.8 million, or one out of every six South Africans being covered by medical aid in the private sector. This situation raises the question of whether the model for private medical funding is sustainable for schemes and administrators, and affordable for consumers. While some third-party administrators are expanding outside of South Africa to create efficiency through scale, this does not address affordability in South Africa. And it opens the door for a digital disruptor to provide a lower-cost option that targets young people through an attractive digital experience. Is sharing of assets viable? One solution would be to look at how other industries have tackled this challenge. In the travel industry, the highly publicised successes of Uber and Airbnb have matured the emerging ‘platform’ business model. 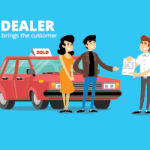 What is different to the earlier success of Apple and Amazon is the use of the platform to share assets (cars and houses) that were solely used by the owners of those assets. And to do so at scale. This concept is appealing for healthcare in resource-constrained countries like South Africa and the rest of Africa. Although sharing of physical assets such as hospital beds is difficult to imagine right now, the sharing of digital assets is far more achievable. As the digital and physical worlds become more closely intertwined through connected ‘things’, the possibility of sharing the capabilities of expensive medical equipment starts to become a reality. 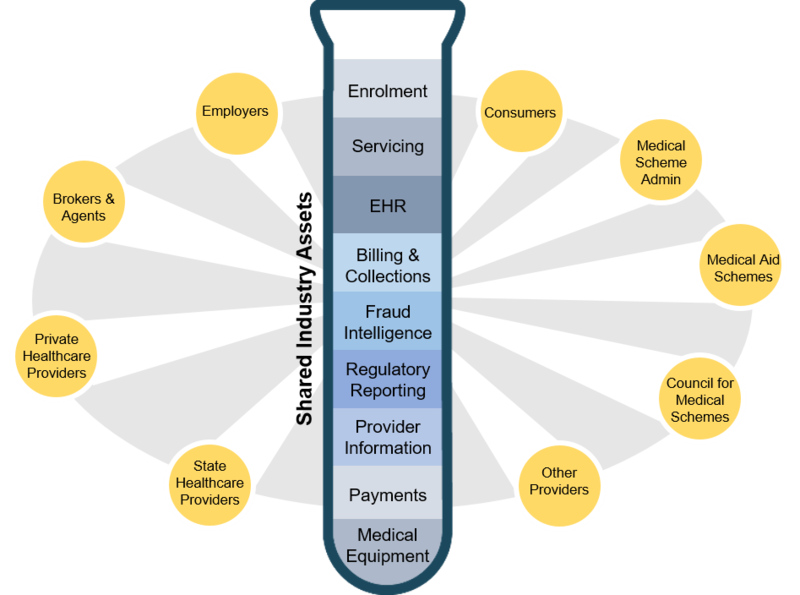 The sharing of assets among administrators, particularly ‘digital’ assets, is the best starting place on a journey towards the sharing of assets across the broader healthcare industry. Third-party administrators such as Discovery Health, Medscheme and Metropolitan Health provide similar services to different schemes; and are supported by a core operating platform composed of IT assets with similar capabilities. 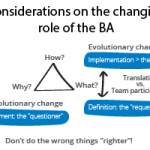 The fact that a scheme can migrate from one administrator to another is evidence of this. Within this core operating platform certain capabilities are less differentiated and therefore provide a more focused set of foundational capabilities for shared industry assets. 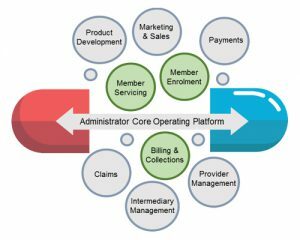 The diagram below highlights member enrolment, member servicing and billing and collections as the best starting point for consideration. If these capabilities can be leveraged at scale, the interests of members, schemes and administrators can be served. The time to do this is now, not only because of cost pressures but also because of rising consumer expectations for more digital and engaging experiences. These consumer expectations are placing pressure on inflexible legacy systems, forcing administrators to choose between continuing to invest in old technology platforms or investing in a modernisation programme. The importance of the South African market for administrators is likely to drive a strategy that combines geographic expansion with investment in the local market. It would be in the interests of consumers for larger administrators to invest in a modern administration platform that can be shared across administrators. This is surely a better situation than smaller schemes failing due to administration inefficiency, and would require replacing legacy administration systems with more flexible and open systems to cater for diverse schemes and integration with a multitude of external systems. There are a number of viable pricing models for these services, including traditional outsourcing and newer models such as pay-per-use. Is an inclusive healthcare industry a possibility? To move beyond the administration of schemes and provide benefit for the wider ecosystem (which includes private and state-owned healthcare providers and citizen consumers not covered by medical aid) will require overcoming greater challenges, but the possibilities are growing rapidly through the digitalisation of medical equipment and other ‘things’. 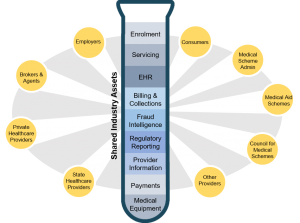 And the greater the connections, the easier it is to achieve industry-wide outcomes such as shared electronic health records (EHR) and shared fraud intelligence. When this happens, the goal of an inclusive healthcare industry starts to become a possibility. Written by BSG executive, Gary Stocks: An executive responsible for research and insights, Gary Stocks is passionate about unlocking potential and accelerating performance at BSG’s clients and people. His focus is on creating value in an increasingly digital world through customer-centric thinking and data-driven insights.